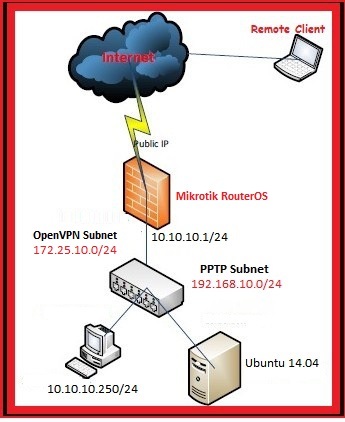 In this post, I’ll describe the step by step procedure to setup Mikrotik RouterOS as OpenVPN server. I’ll use the Ubuntu Server in order to create CA, server and client(s) certificates. This tutorial describes that how to configure the OpenVPN Server in CentOS 6.4 and clients in Windows XP/7. 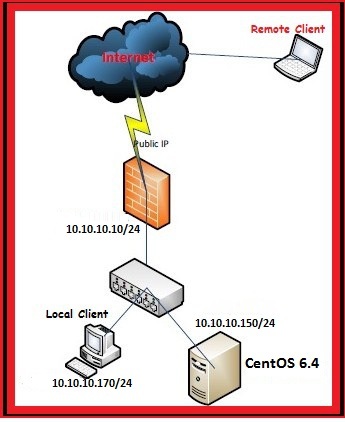 I am taking the scenario of SOHO network, which is protected by Firewall, we’ll implement the OpenVPN on internal CentOS 6.4 server to access the internal SOHO network (Server and PCs) through the internet from anywhere securely. This tutorial describes that how to configure the OpenVPN Server in Ubuntu and clients in Windows XP/7. I am taking the scenario of SOHO network, which is protected by Firewall, we’ll implement the OpenVPN on internal Ubuntu server to access the internal SOHO network (Server and PCs) through the internet from anywhere securely.